The traditional approach to Car Park ventilation utilises systems that will provide fresh air based on a given number of air changes per hour; however, this is inefficient in times of low traffic, when less ventilation is required. By incorporating Fläkt Woods systems, this inefficiency is greatly reduced - ventilation can be designed using a CO, LPG or NOx sensor monitoring system, ensuring that selected fans run only when necessary. 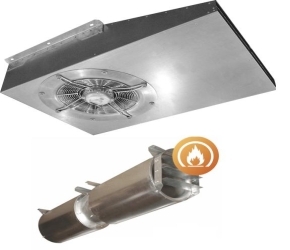 Furthermore, our product range includes High Temperature fans, essential in clearing smoke and minimising damage in the event of a fire. Fläkt Woods realises the importance and possible life saving function of our Thrust Fan System and unlike many, offers full CFD modelling to every customer, on every project. With over a 99 uptake by our customers, they too realise the importance of getting it right. CFD ensures system optimisation and, more importantly, that the occupants safety is not compromised. This also avoids making a project unnecessarily expensive by using too many fans, or an under performing system by specifying too few. Fläkt Woods Thrust Fan System is one of the most efficient and cost effective car park ventilation systems available on the market today. Both day-to-day pollution and emergency smoke are safely and effectively ventilated. Designed to the highest standards and meeting the most stringent criteria to ensure all design requirements are met.